Jehle (Cigar Box Ukulele, 2016, etc.) 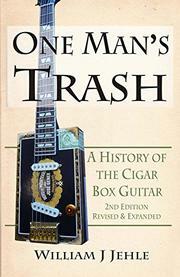 outlines the curious history of cigar box instruments in this revised edition of his 2010 book. The author, a longtime builder and player of cigar box guitars, dons a historian’s hat in this nonfiction work. The book, like its subject, is a something of a folk-art hodgepodge: “While I cannot promise that all the pieces are here,” writes Jehle in the foreword, “together we will assemble the disparate parts—snippets, one-line mentions, newspaper and magazine articles—into a cohesive whole.” Acknowledging the niche nature of his area of study, the author coins a term for the field: “detritomusicology, from the root words detritus and musicology.” He covers not only the cigar box guitar, but also cigar box versions of the violin, banjo, and ukulele. After a brief explanation of the origins of the cigar box itself, Jehle takes readers through a history of related instruments, from the first known artifact—a violin created sometime in the 1840s by a child musician who couldn’t afford a standard version of the instrument—to the creations of four later innovators: Edwin Forbes, Daniel Carter Beard, Satis Coleman, and Sam Kamaka Jr. After exploring the relationship between cigar box music and the wider popular culture, the author examines the evolution of the instruments by examining primary sources and diagrams dating from the late 19th century to the turn of the millennium. Jehle’s scrupulous prose demonstrates his deep respect for his subject. He quotes perhaps too extensively from his sources, giving the book an academic tone, which may not interest readers expecting more of a popular history. Even so, the work is well-researched and accompanied by many charts and illustrations, culled from old publications. Jehle manages to capture both the novelty and the artistry of cigar box instruments, and even readers with no previous interest in this curious subculture will come away with an appreciation for the ingenuity behind it. A thorough book on one of the least-explored corners of American music.